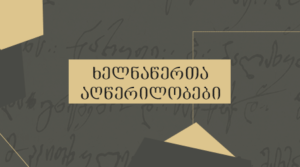 Georgian calligraphic school has centuries-long history. A book, re-written by someone’s hand, had instantly become a phenomenon. Throughout centuries, Georgian books were made in different literary hearths. 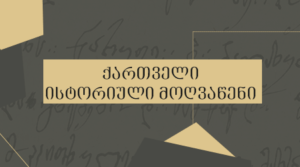 Bishops in different monasteries would write manuscript books and with great caution, they paid attention to graphic outline of the Georgian alphabet, decorated letters and other decorative elements. Unfortunately, nowadays, the hand-written tradition is lacking popularity; many people do not understand what good a refined calligraphy may bring. For this reason, The National Centre of Manuscripts, Ministry of Education and Science and NGO “Tsami” (Second) decided to organize a competition (2010) – “Georgian Calligraphy”. Popularize Georgian writing system and Georgian calligraphy. Encourage and develop culture of hand-writing and demonstrate creative skills of competitors. 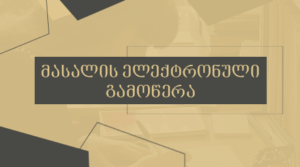 Anyone, living in the Republic of Georgia as well as living abroad, may participate in the competition. The best calligraphic works will be taken out for an exhibition.